Pittsburgh, USA -- The fourth exhibit in the Andy Warhol Museum's Word of God series, Max Gimblett's "The Sound of One Hand" brings to focus the world of Zen Buddhism. An artist living and working in New York City since 1972, Gimblett has been focusing on Buddhism since 1965 when he first encountered poet and novelist Kenneth Patchen's (1911-1972) painted "picture poems" in San Francisco. "It has never been the main focus," Gimblett, 75, says, admittedly "sharing my interests equally with Jungian studies and the history of visual art, particularly painting." But a serious interest in Buddhism was so much a draw that, "I took my vows in 2006 and am a lay monk of Rinzai Buddhism." That goes a long way in explaining why the works on view have an overall zen-like quality, especially the earlier brushworks on paper that date as far back as the 1980s. Here, the work is distinctly divided into two types -- enso and koan paintings. Simple ink brush drawings of circles on rice paper, the enso pieces are a good place to start in terms of entering Gimblett's world. Enso is a Japanese word meaning "circle" and is a concept strongly associated with Zen. "Enso is a common subject of Japanese calligraphy, symbolizing the universe, strength and Enlightenment," Gimblett says. "Typically drawn in one stroke with a thick paintbrush, the enso represents absolute reality and the void in Zen art." 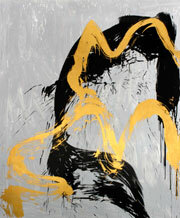 Gimblett says that some artists will paint enso daily, "as a kind of spiritual diary." Enso is usually created on silk or rice paper. "The single stroke does not allow for any modification -- the brushed circle represents the spirit of the moment of creation," he says. "In the circle nothing stops, nothing comes to an end, it just keeps going." The other side of the gallery features two of Gimblett's koan books: "Sage," which includes ink drawings by the artist and koans from the book; and "The Zen Koan," a series of published lectures on koan study by Roshi Isshu Miura. A book of "Broadway Koans" is also on view, which includes original drawings by Gimblett and poems by John Yau. "A koan is a story, dialogue, question or statement that cannot be fully understood through rational thought alone," Gimblett says. Thus, the visual component of these works exist as pure poetry in the form of simple lines on rice paper. Koan study is a unique method of religious practice intended to bring the student to the direct, intuitive realization of the "Ultimate Principle," or "Absolute Mind." Gimblett says koan study has a distinct place in Rinzai Zen Buddhism, which emerged in China from the teaching line of Linji Yixuan and was first introduced to Japan by the Japanese monk Myoan Eisai (1141-1215). For Rinzai Zen Buddhists, meditation and koan study are methods employed to bring its followers to "satori," or enlightenment. The second gallery houses much more recent work, including several large-scale pieces made specifically for this show, such as "Everest -- for Andy Warhol" (2011) and "The Princess Mnemosyne" (2011). These large, rectangular works, with their shiny surfaces that hold thick, expressive brushstrokes that seem to hover above, and even float below, the surface, demonstrate not only Gimblett's interest in creating work that responds to the environment of the museum but also his adventurous nature and intense love for work itself. "My art evolves," he says. "It's different every year. At 75, I am no longer preoccupied with self. That's been discovered and put aside. Now it's not-self." Opposite these works, the wall is filled with more than two dozen smaller pieces of similar shiny ilk that are each made of shaped canvases that are of a "quatrefoil," or four-lobed flower petal design. Similar to the Rose Mandala form found in window's of English churches and cathedrals from the Middle Ages onward, Gimblett says the shape also makes reference to the four Jungian typologies (Thinking, Feeling, Sensation and Intuition), as well as the world clock, and the compass indicating north, south, east and west. "I began with these in 1983," Gimblett says. "(They were) aimed at the whole being, with the idea springing from Le Corbosuier's Modular Man." Gimblett says that, seen together, these pieces are meant to create an "altar of perception." "The message hopefully is one of the spirit," he says. "All mind, no mind, one-stroke bone. (This is) the altar of perception. Healing, centeredness, the word became flesh and lives amongst us." After all, he says, "That's why the series is called 'The Word of God.' "